Just about everyone likes to cuddle cute furry animals. Cats and dogs started out as wild animals, so what's wrong with keeping native Australian mammals as pets? As it turns out - quite a lot! Evidence shows that most companion animals became domesticated thousands of years ago. Dogs, who descended from Grey Wolves, formed a symbiotic relationship with mankind over 14,000 years ago. For those wanting a more technical explanation, animal domestication is a coevolutionary process in which a population responds to selective pressure while adapting to a novel niche that included another species with evolving behaviors. [a] The scientific theory of domestication suggests an evolutionary genetic predisposition towards domestication. [b] Put simply, the DNA of some animals may make them more predisposed to domestication - so it is in effect a "mutual decision" to co-exist. 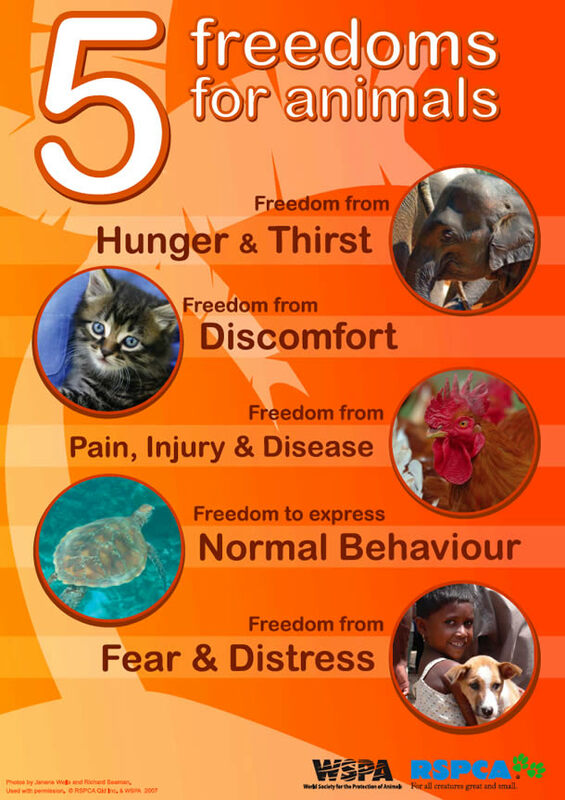 Australia is one of many countries that subscribes to the five freedoms, guaranteeing all captive animals - whether pets, working animals or livestock, certain freedoms. [c,d,e] Through the process of 'domestication' native mammals will be denied the basic freedoms guaranteed to even farm chickens - the freedom to express normal behaviour and freedom from fear and distress. Looking at the overseas experience where sugar gliders are kept as pets, most continue to be denied freedom to express normal behaviour and many are shown to be denied freedom from pain, injury, disease, fear and distress. In the wild, sugar gliders can glide the length of a football field - but not in captivity, and as nocturnal animals, many 'pets' are forced to be active in daylight hours. See our sugar glider page for more information. Captive native animals may not know how to avoid predators, find or identify appropriate food sources or find refuge in the environment. The result is death from predation, dehydration, starvation or exposure. Introduction of diseases mainly seen in captive animals into a naïve native population. Examples include snake mite in juvenile blue tongue lizards, resulting in high morbidity and thus less recruitment into the adult population, or spillover of Sunshine virus into the wild population of pythons where the likely outcome is extinction of naïve native species. Where release of animals not suited to the environment may over generations result in dilution of adaptive genes to the environment. “The risk posed by increasing the volume of animals and species kept as pets is likely to increase the threat to wild populations of native species." "Deregulation is also likely to facilitate, via releases and escapes, the establishment of populations outside their native ranges with uncertain ecological consequences. This is already an issue with species of birds, frogs reptiles and mammals and will be exacerbated by the proposed licensing changes”. (There is the) potential of animals escaping or being intentionally released and becoming a threat to NSW’s native ecosystems. Some mammals are susceptible to myopathy - which in layman's terms mean they can literally die from the stress of captivity. Toxoplasmosis has been reported as a significant cause of morbidity and mortality in captive marsupials within Australia and internationally. [i] It is often spread by cats, can kill native mammals such as Quolls, and can be transferred to humans. Any bat species in Australia could carry Australian Bat Lyssavirus which can be transferred to human through bites or scratches. ABLV can be fatal if not treated. Any flying-fox could possibly carry Hendra Virus, which can be fatal to Horses - and transmissible from horses to humans. Koalas are widely infected with two species of Chlamydia, C. pecorum and C. pneumoniae - a disease that can cripple and kill Koalas in captivity or in the wild. A range of other serious ailments are recognised including Q-Fever, cryptosporidiosis, and leptospirosis - some of which can also be transmitted to humans. It is now believed that zoonotic infections from wildlife may be the most significant growing threat to global health of all the emerging infectious diseases - so keeping native mammals may also be a threat to human health. [ k ] We just don't know what novel diseases and pathogens we might be inviting into our homes by keeping wildlife as pets. Animal welfare organisations already respond to incidents of cruelty towards Australian native animals, including birds, possums, kangaroos, koalas, wombats, reptiles and more. ​In the case of free-roaming wildlife, cruelty is often exhibited as random acts of opportunistic violence. Increasing access to these animals by allowing them to be kept, will increase their exposure to other welfare issues such as abandonment, neglect, poor husbandry, accidental injuries, and interactions with predator species such as cats. RSPCA (NSW), Animal Welfare League (NSW) and OEH confirm that when the sale of reptiles increased in NSW, there was a corresponding increase in the number of reptiles coming in to care. They anticipate the same would occur with native mammals. But RSPCA and Animal Welfare League do not have the expertise or equipment to house, care or treat native mammal species. Current Codes of Practice require different species be kept in a manner that prevents prey and predator species from detecting the presence of the other. Welfare agencies would need to modify and/or expand their facilities to cope with any influx of native mammals. Ramping up to provide the specialist requirements necessary to provide care and shelter for these native mammals would impose an unreasonable burden on these organisations. Neither is it appropriate for regulatory welfare compliance agencies to ‘outsource’ the care of mistreated animals to hobbyist or commercial enterprises. Many Australian mammals are nocturnal. Their senses have been adapted for the dark, and some are quite intolerant of light. Quite often nocturnal mammals are not active until quite late at night, and then quite active and noisy until shortly before dawn. Despite mammal keepers knowing this, we have seen many examples where nocturnal native mammals are kept active during daylight hours suggesting many keepers are not genuinely concerned about the welfare of the animals in their care. Flying-foxes become extremely vocal for long periods of time when fighting and mating, and exude a musky odour during breeding season, which can make them unwelcome in urban environments. Many of these ‘unsociable’ behaviours are ingrained, and are still seen in species such as sugar gliders, even after generations of ‘domestication’. Some native animals including dasyurids, have a short life cycle of birth, breeding and death and can quickly become inbred, so new animals with different genes would need to be constantly introduced. Proponents argue that this is no concern, as the issue could probably be addressed if private keepers entered into agreements with zoos and wildlife parks to move excess stock onto private keepers. But as zoos and parks are licenced separately, such an agreement is not certain – especially if there were large volumes involved. There would need to be a disciplined approach to record keeping and there remains doubt as to whether such a disciplined approach would be practiced by hobbyist keepers in the real world. ​​Those promoting the case for increased native mammal keeping often cite the example of how sugar gliders have been ‘domesticated’ overseas, suggesting these animals can adapt to domestic environments. However, real-world examples show that as the uptake of “wildlife” species increases, people with less expertise or concern about welfare or conservation outcomes become involved, especially when there are few impediments to impulse-buying. Any good intentions around best practice are lost in the process – as demonstrated with sale of sugar gliders in the USA. Commitments made by well-meaning, committed keepers today are not binding on pet owners a few years down the track. It sought to “strategically inform the potential development of an industry based on use of native mammals as pets in a way that helps to ensure positive conservation and welfare outcomes”. ​It found only two mammals that could potentially be kept "as pets" - the Eastern Quoll and Mitchell’s hopping mouse. However it qualified its finding, saying these animals could not be kept in the same way as "traditional pets". The report also cautioned that “there are a number of negative side-effects that such a development could potentially entail, for native wildlife (in the wild) and for the welfare of the species kept”. ​The NSW Office of Environment & Heritage (OEH) lists this as a concern in relation to native mammal keeping. At a forum in October 2018, senior NSW National Parks compliance officers said that in recent compliance actions where illegal wildlife trafficking was intercepted, a significant percentage were facilitated by alleged offenders claining to be native animal 'pet' owners. They were exporting common native species with little monetary value in Australia, but capable of fetching big prices overseas. They advised that any proposals to reduce the protection of native animals (such as reducing strict licensing conditions) would reduce the ability of authorities to thwart the illegal trade in wildlife. On a contrary note, the “Native Mammal Keepers of NSW” (a Facebook group) submitted a response to the OEH discussion paper on wildlife licensing, saying that “Illegal collection is only of concern where local populations are genuinely at risk or a species has a threatened conservation status. Welfare concerns related to the illegal wild collection of mammals are minimal. Illegal wild collection of mammals will always be small, hence only very few animals will be impacted”. [r] It would appear that groups like this do not understand Australian ecology, are unaware of the atrocities perpetrated on common native animals, and don't care about animal welfare or illegal wildlife trafficking. (a) Larson G, Bradley DG (2014). "How Much Is That in Dog Years? The Advent of Canine Population Genomics"
(q) Ecos Magazine May 2011, Can keeping native mammals as pets help conserve wild populations?